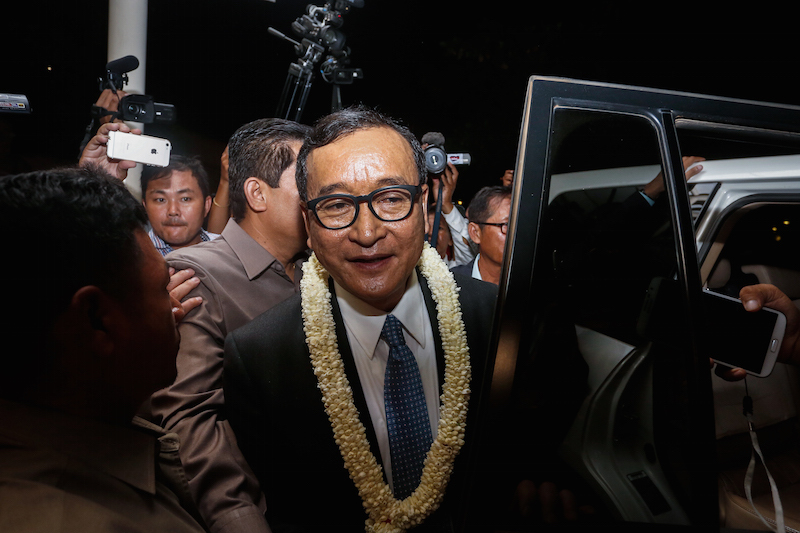 As his party is in the midst of negotiations to free jailed human rights workers, opposition leader Sam Rainsy over the weekend promised to “crush” those in the CPP who do not respect a prospective 2018 national election victory. Summarizing his response to the question of whether Prime Minister Hun Sen and his ruling party would accept an election loss, put to him during a Voice of America interview, Mr. Rainsy wrote on Facebook that they would have no choice. “In 2018, the CNRP will form a new and legitimate government and what will remain from Hun Sen’s CPP will just be a bunch of rebels who will be crushed by the legitimate government commanding the national armed forces with the support of the international community on the basis of the 1991 Paris Peace Agreements on Cambodia,” he wrote. Mr. Rainsy said that Vietnam, which installed CPP leaders currently in power almost four decades ago, would also support a new CNRP government, and dismissed Mr. Hun Sen’s threats of a violence following a CNRP election victory as bluster. “But raising now this issue of transfer of power in 2018 is just part of a political and psychological war, with Hun Sen bluffing—as always—when he threatens the CNRP with a civil war if he loses the forthcoming elections,” he said. Mr. Hun Sen ramped up his warnings of civil war ahead of the 2013 national election, and has continued to say that a CNRP victory will inevitably lead to violence, warning late last year that any effort to remove the current military commander and National Police chief would lead to a backlash. 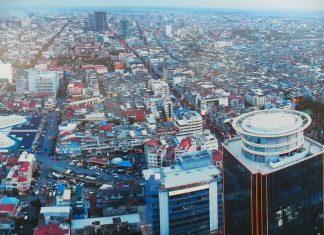 The predictions by Mr. Rainsy, who is currently banned from returning to Cambodia, fly in the face of that made by historians and analysts, who are convinced that Mr. Hun Sen would likely maintain control of much of the military even after an election loss, and use loyal units to remain in power if necessary. Historian David Chandler said in a radio interview in May that Cambodia would not have a functioning democracy until Mr. Hun Sen was dead or overthrown, which he said would only happen through force. 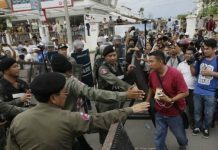 “I’m never going to say on your program or anywhere else that Hun Sen should be overthrown by force, but he is not going to be overthrown any other way,” he said at the time. Fellow historian Milton Osborne offered a similar analysis in an article for The Interpreter last month, but noted that a CNRP victory was by no means guaranteed, and that a fragile power-sharing agreement might be an inevitable result if such an outcome eventuated. 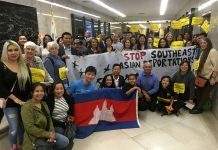 “In short, on past and present evidence…Hun Sen and his party are ready to take all actions that they see as necessary to stay in office. Whether their actions accord with western concepts of the rule of law is not a consideration,” Mr. Osborne wrote. Meas Ny, a political analyst and social researcher, said on Sunday that it was simply too soon for Mr. Rainsy to be making such pronouncements. “The ruling party are still looking to break the opposition. The CNRP should not be too proud to think they will win the election,” he said, adding that such provocations would do nothing to help the post-election process if the CPP did lose. 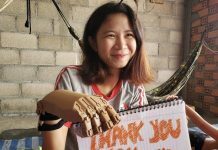 Mr. Ny agreed that Vietnam would have little choice but to accept change, though it would prioritize treatment of its own citizens out of concern for how they might be treated by the CNRP, whose leaders have a history of xenophobic rhetoric toward the Vietnamese. “I think after a majority of people vote for the CNRP, Vietnam cannot do anything but take care of Vietnamese living in Cambodia,” he said. Carl Thayer, a Southeast Asia expert at the Australian Defense Force Academy, said that he fundamentally disagreed with Mr. Rainsy’s projections. “If for any reason a manipulated election is not possible Hun Sen will find a pretext to intervene and dispatch the opposition,” Mr. Thayer said, adding that neither Vietnam nor China would condemn a violent repression of the CNRP, though they would avoid overt support. “Both China and Vietnam realise only too well that if they overtly intervened in support of Hun Sen against Sam Rainsy this could ignite Cambodian nationalism against them,” he said.